This transmitter transfer high quality stereo sound to bluetooth receivers(headphones,speakers,TV and etc). Allowing you enjoy wonderful and great music with your intimate freely. 1.Connect the transmitter with your TV via the optical cable, 3.5mm audio cable or coaxial cable. 2.Long Press the power button of the transmitter till with 2 blue lights flashes alternately. 3.Open your bluetooth headphone ,make sure the headset in pairing mode. 4.Press the power button of the transmitter quickly to pair with your bluetooth headphone. 5. Switch to the "Input mode switch button'" to the mode(optical ,3.5mm audio or coaxial) you choose, check the correspond indicator is bright, otherwise, you may get high pitched screenching noise. Bluetooth Transmitter: Turn regular stereo audio devices into Bluetooth-enabled transmitter, Bluetooth 4.0 tech can pair with 2 headphones/speakers at once, allowing you enjoy wireless stereo movies or music wirelessly. 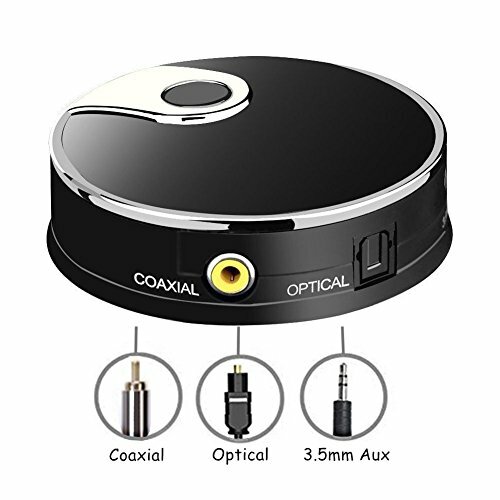 Removing troubles of wired connection, get maximum flexibility with three connectors: 3.5mm (AUX and RCA), optical (TOSLINK) digital and Coaxial Input(Coaxial cable not included). Low Delay: AptX Low Latency eliminate Bluetooth audio delay, so you can watch TV / Movie / Video and listen to high-definition sound in perfect synchronization.